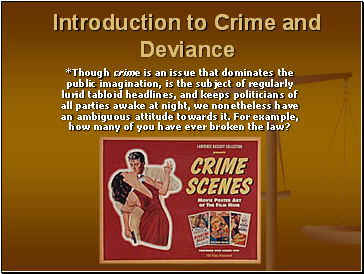 *Though crime is an issue that dominates the public imagination, is the subject of regularly lurid tabloid headlines, and keeps politicians of all parties awake at night, we nonetheless have an ambiguous attitude towards it. For example, how many of you have ever broken the law? 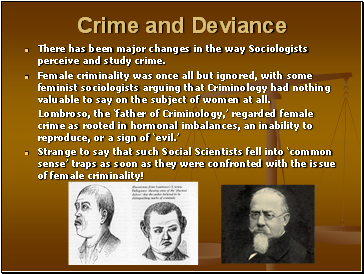 The study of crime and deviance involves a number of contributing disciplines, not all of which we will be required to consider; statistics, psychology, biology to name but a few, and of course the largest contributor sociology. 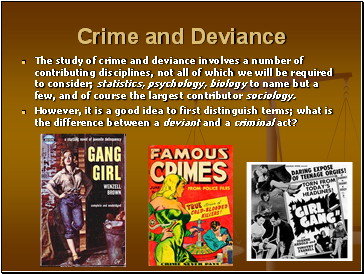 However, it is a good idea to first distinguish terms; what is the difference between a deviant and a criminal act? A crime is any act which breaks the formal, written laws of a state. Can you think of examples, and what formal sanctions (or punishments) await those involved in either committing a crime, or allowing such acts to take place? 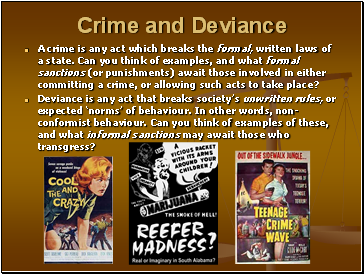 Deviance is any act that breaks society’s unwritten rules, or expected ‘norms’ of behaviour. In other words, non-conformist behaviour. Can you think of examples of these, and what informal sanctions may await those who transgress? 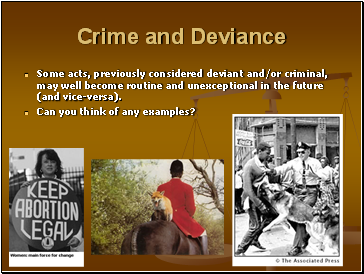 Some acts, previously considered deviant and/or criminal, may well become routine and unexceptional in the future (and vice-versa). 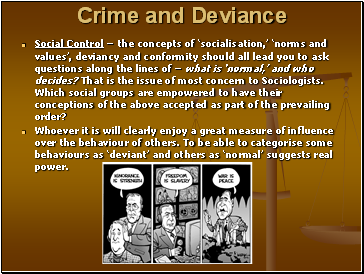 Social Control – the concepts of ‘socialisation,’ ‘norms and values’, deviancy and conformity should all lead you to ask questions along the lines of – what is ‘normal,’ and who decides? That is the issue of most concern to Sociologists. Which social groups are empowered to have their conceptions of the above accepted as part of the prevailing order? Whoever it is will clearly enjoy a great measure of influence over the behaviour of others. To be able to categorise some behaviours as ‘deviant’ and others as ‘normal’ suggests real power. 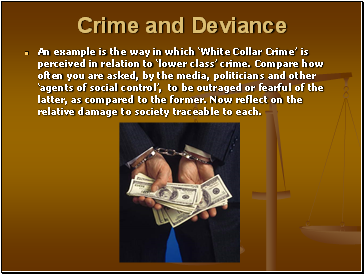 An example is the way in which ‘White Collar Crime’ is perceived in relation to ‘lower class’ crime. Compare how often you are asked, by the media, politicians and other ‘agents of social control’, to be outraged or fearful of the latter, as compared to the former. Now reflect on the relative damage to society traceable to each.